Quick, simple deal for all you movie fans out there (which is most of you I presume). FANDANGO is once again doing a BOGO offer on movie tickets, which means you can get a free ticket to a certain upcoming movie featuring that bat fella. It's a small, independet film with no real budget for advertising, you may want to check it out. So all joking aside, I want to see The Dark Knight. I'm no fan of standing in line though, so I'll probably see it a few weeks after the initial release (but on IMAX for the best viewing experience for my money). 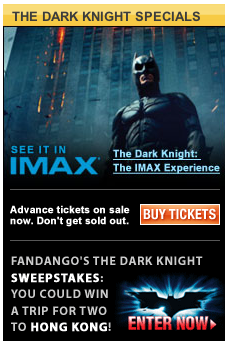 I will, of course, be seeing it with a friend and we'll basically be paying half price thanks to FANDANGO . The deal: All you have to do is add a minimum of two tickets to your cart and then pay using your Discover Card. The cost of one ticket will automatically be deducted from your cart. Fandango ran the same promotion last year and it worked great. But get your skates on, the deal ends 8/31/08. Thanks to The Bargainist for pointing this one out. oh lame. I don't have a Discover card. They keep on spamming me with their applications, and then finally I gave in and applied for one and they rejected me. How lame is that? ask someone with a Discover Card to get them for you, and give them the cash? for viewing 2 weeks after the opening. You can use it at anytime of the day. Thanks for the hot tip. I can't remember the last time I went to the movies... actually, it was last week, to go see Wall-E with our kids, which BTW I loved. Can't say I'll be seeing Dark Knight any time soon, though I'm hearing all the accolades of Ledger's standout performance. I called Fandango, because I couldn't get this to work for me. Apparently this was limited in the amount of BOGO tx they would give out and they met their quota already. Oh, well! We did as instructed to see The Dark Knight and were charged the entire price of both matinee tickets and the $2.00 convenience charge for a total of $18.00. With a recent layoff we wouldn't have gone if we'd known we'd have to pay for both tickets. "Good through 8/31" and "limited number" are different things - just wanting to vent.